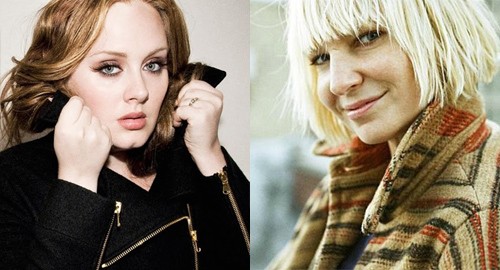 Sia has premiered her new single, Alive, which was originally written for Adele's next album. "I wrote it together with Adele but it was rejected at the last minute," the 'You're Never Fully Dressed Without A Smile' singer recently told RTV Slovenija. "It's about Adele's life, so I now sing a song from Adele's perspective." If that's true, the song marks a radical departure from the love-lorn lyrics of Adele's last album, discussing despair, doubt and (if I'm hearing it right) the anti-insomnia drug Ambien. Musically, we're on more familiar territory - with a foot-stomping arrangement that recalls the Ryan Tedder-assisted Rumour Has It. Sia's vocal performance is extraordinary, too, with an unrestrained vocal that sounds like she's screaming herself hoarse. Alive is the first single from Sia's forthcoming album This Is Acting - so-called "because they are songs I was writing for other people," Sia recently explained. "I didn't go into it thinking, 'This is something I would say'. It's more like play-acting. It's fun."